Elige entre múltiples horarios de excursiones por la mañana o por la tarde. Diríjase al rancho Kualoa, de propiedad familiar, una ganadería en el sagrado valle de Ka'a'awa. El lado de barlovento de la isla, donde se encuentra el rancho, tiene un paisaje muy diferente al de las playas de Waikiki y está maduro para la exploración. Los acantilados, las playas y la espesa selva tropical han constituido el telón de fondo de muchas películas de éxito, como Pearl Harbor y Jurassic Park. Conozca a sus guías de aventuras experimentados para una breve orientación y luego adáptese con su equipo de seguridad. Despega a lo largo de la serie de catorce tirolinas, cada una de ellas nombrada por un aspecto culturalmente significativo del Valle de Ka'a'awa y con una longitud de 200 pies a 1/4 de milla (.4 km). El curso tiene un sistema de frenado automático, por lo que todo lo que necesita hacer es sentarse y disfrutar del viaje. Vuela por el bosque y cruza arroyos naturales. Cruce varios puentes colgantes y aprenda sobre la vida vegetal y animal de su guía a lo largo del camino. Embárquese en un par de caminatas cortas a lo largo de senderos naturales, cada uno de aproximadamente 5 minutos de duración, ya que su guía señala las plantas medicinales hawaianas y describe sus antiguos usos tradicionales. We had a GREAT time. The staff Connar, Ashley and Zach were awesome. A must-do... worth every penny. Rhianna thought this was pretty good. She has done a few different ziplines in different countries and said this was quite good and on a par with others. The guide was helpful and friendly. It was the best part of my trip in Hawaii. The view, staff, zipling and extra swinging bridges! This was our favorite tour we did on our trip. Our guides, Amy, Jesica, and Kayleen were wonderful. They were so much fun. Our driver, Kevin, who took us to the base camp where our tour began was full of information about the ranch and all the filming they do there. It was like doing 2 tours. We would love to go back again. I would highly recommend this tour to anyone that is considering it. Our driver Jaron, who took us up to zipline platform, was fun and nice. He pointed out areas where certain movies were made and gave us a brief history of the Kuala Ranch. On arriving to the main area we were greeted by our guides Jacki, Went I know there is a story behind his nickname and Mark. They took us through putting on our harnesses correctly with a few laughs from how snug they had to be. I had my GoPro with me and had planned on wearing the harness over my helmet but Jacki provided me a helmet that had a snap on feature for GoPro cameras. This was definitely a plus for me. They told us we would be traveling to seven platforms to zipline from which varied in length. Our group was small with only five people Tracy and Cody, Steph and Luke and myself which made conversation with everyone easy. First platform they instructed us what and what not to do when traveling down the line and then they asked for one us to start off the group. Since I had been looking forward to this I didn't hesitate to go first. From that moment on I looked forward to the next zipline. Through out the tour Jacki, Went and Mark were fun and even had us laughing at ourselves. When we were done our guides were gracious enough to pose for a few pics. I would definitely do this again and recommended it to any at the hotel, where I was staying, to anyone who was interested. Thanks again to the best guides. 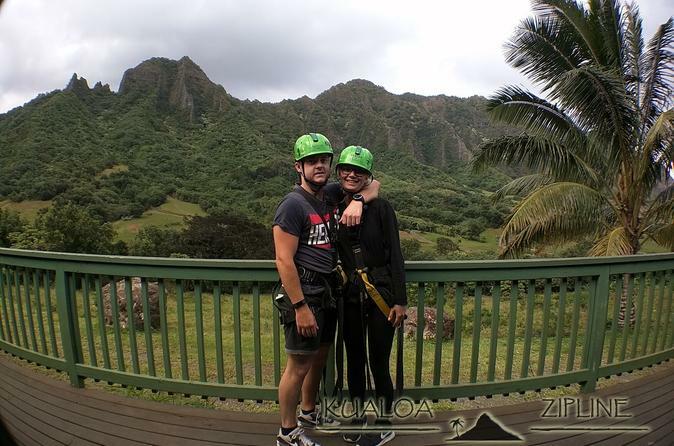 Jacki, Went and Mark who made my first experience Ziplining a great memory. Good fun, great scenery, really nice guides who made this a great experience and a great day. 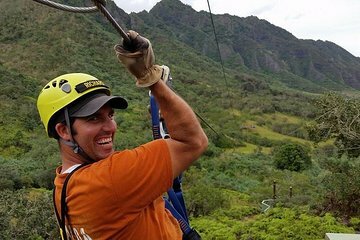 Be aware that this is more of a family zip-line experience without the lines being terribly high at all. This is not a tree-top zip-line experience so look elsewhere if you are looking for something more challenging. That being said, everyone can have a bit of fun doing this and can participate - even the scaredy cats. Thanks for making this fun guys. Friendly crew. Nice way to sight see.